The Gulf NATO of the GCC has expanded into a wider Arab NATO through the inclusion of Egypt in the Saudi-led War on Yemen. Egypt’s incorporation into Saudi Arabia’s sphere of influence, despite it being much more populous and militarily stronger, is the result of the billions of dollars that the GCC has given al-Sisi since he came to power. Thus far, there has been over $20 billion in general aid and another $12 billion promised for ‘New Cairo’, Egypt’s plan for building a new capital, although there could be potentially much more that was covertly bequeathed in the past year and a half. All of this money has come with a price, however, since Egypt is now active in the War on Yemen, despite its catastrophic history of involvement in the country during the 1960s North Yemen Civil War, and has surprisingly even offered to send ground troops into the country if need be. The only reason that al-Sisi would smack the memory of the over 20,000 Egyptian soldiers that died in Yemen under Nasser and betray Egypt’s fundamental national interests by becoming the House of Saud’s ‘pit bull’ is simply because of the billions of dollars that he has received from them. Thus, the oft-mentioned phrase ‘beware of Greeks bearing gifts’ (in reference to the Trojan Horse of millennia prior) should be contemporarily modified to ‘beware of Gulf Sheikhs bearing gifts’. The Saudi virus of sectarianism was already present in Yemen prior to recent events, but it was never the dominant engine of conflict in the war-torn country. The reason it’s become a key word in the current war has to do with the success of Saudi and Israeli propaganda in convincing the region and the world at large that Iran is utilizing Shia-affiliated militias to control the Mideast, even though that isn’t the case. 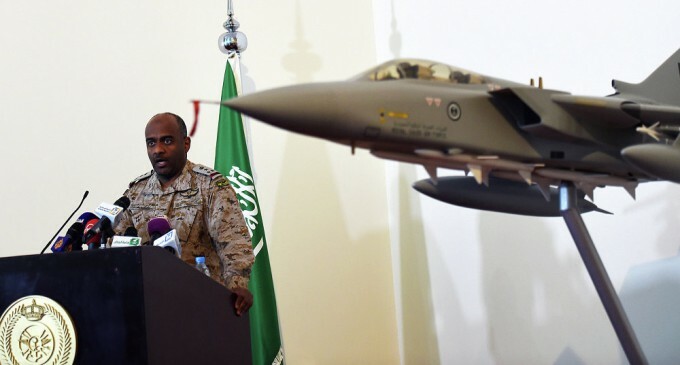 This narrative is very convenient for the Western mainstream media and its political leaders’ designs for the region, and unfortunately, even certain non-Western media outlets have naively fallen for this ruse, which is especially evident when they emphasize that the Saudi-led Arab NATO is composed of Sunni-majority countries fighting against the Shia-affiliated Houthi movement. Taking the story even further, they broadly speculate that Iran is supporting the Houthis, using the same flimsy circumstantial/demographic arguments that have been deployed when imagining the massive non-existent Russian support for the Eastern Ukrainian Republics’ war against Kiev. To this day, not a single Russian tank has ever been found in Ukraine, and it’s likely that no proof of similar Iranian involvement will ever be found in Yemen either. These are overwhelmingly provided by the US to Egypt and the GCC. Egypt will provide the brawn and cannon fodder for when the going gets tough. Saudi Arabia is expected to bankroll most of the nascent organization (either overtly or covertly). The Arab League’s rubber stamp on the organization gives the outside world the misleading façade of regional acceptance, although Syria was obviously excluded from this process and Iraq has voiced its serious reservations. This regional behemoth is anticipated to satisfy the tripartite strategic goals of the US, Israel, and Saudi Arabia. The Arab NATO is without a doubt centered on pushing back against perceived Iranian influence and destroying Resistant & Defiant states like Syria that contravene Washington’s preferred unipolar order in the region. The ultimate goal is to use the War on Yemen to deepen the military integration between the members of the ‘Mideast Axis of Evil’ prior to its eventual deployment against Syria in directly pursuing regime change. The only thing that can realistically prevent this would be if al-Sisi ever attempts to free his country from Saudi control and reassert Egypt’s multipolar independence, but such a move would be extremely challenging to even initiate considering the overpowering influence that Saudi capital has over Cairo and the implicit militant threat that it wields in the Sinai. One should always keep in mind that ISIL and militant Islam’s ideology was birthed by the official Saudi state ideology of Wahhabism, which Riyadh strategically applies as a Sword of Damocles over the head of its international subordinates. If al-Sisi ever gets out of line, he would have to contend with the realistic propability that the Saudis would pump loads of Wahhabist propaganda and (covert) preachers/activists into Egypt (and specifically the Sinai) with the intent of fomenting an extremist disturbance and terrorist activity. The irony about Egypt’s participation in the Arab NATO is that al-Sisi was extremely sensitive to the activities of the Qatari-supported Muslim Brotherhood, but he immediately jumped in bed with the Saudis who basically do the exact same thing but with different groups and different names. Still, judging by the development of current events, it doesn’t seem likely that he’ll rebel against his Saudi masters anytime in the near future.